Our Forest Kindergarten will include 3 days a week in the classroom and the other 2 days learning out in nature! See what our kids have been up to on our new Forest Kindergarten Blog! Research shows that children who play and learn outdoors are healthier physically and mentally, do better in school, have higher self-esteem, demonstrate good self-discipline, are good problem solvers, and are more cooperative with others. Place Based: accessing our wonderful coastal ecosystems. 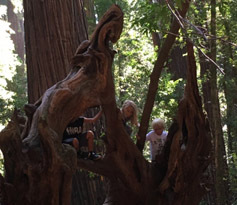 Engaging and Student-Guided: nurturing each student's natural wonder and curiosity. Physically Active: developing healthy minds and bodies. Sensory-Rich: inspiring the development of all the senses. For more information, read our Q & A handout by clicking here.